We're almost here folks! 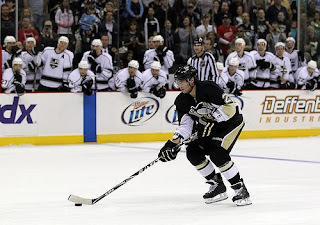 The Pens start their 2011-12 season in just three days. Once again I will be doing recaps of the defensemen's performances weekly throughout the season. Here are my humble predictions of their point totals and how they will perform this season . Last year Kris Letang had a stellar start to the season, with six goals and 30 assists in his first 41 games. He was voted into the All-Star Game thanks to an avalanche of write-in votes and his name came up in Norris Trophy talk. Unfortunately, he found some struggles in the second half of the season, but that does not take away from his talent. Quoted by Letang, "I didn't have the best end of the season, but I think I still improved things in my zone. We played a lot of one goal games, and I think I played in a lot of six on five or five on six situations at the end of the game. I still learned a lot of things." He has learned a lot at his young 24 years of age, but will always work to improve. He is stronger and more physical than he appears at first glance. His dedication cannot be denied. I watched him in training camp practice his shots on net over and over again. Last season he banked 236 shots on goal in 82 games. Most of us have seen his wicked off-season workout video. With Bylsma looking to play four forwards and one defenseman on the power play, that will be Letang's spot. Expect to be impressed by him this season. Last season Orpik found chemistry in his pairing with Letang. His gritty style of play complements Letang's offensive capabilities. Orpik has become one of the NHL's leading hitters, banking 194 hits last season. He is a dominating presence on the penalty kill and is a tough player to be matched up against. Orpik wears the "A" deservedly. He brings a leadership presence to the locker room and won't mince words. However, he has had some troubles after his abdominal surgery, and his absence has been noted during training camp. It has been questioned whether or not he will start the season, but with Morrow and Strait being sent back to their respective WHL and AHL teams today it may indicate he is close to playing. Zbynek Michalek definitely found his stride the second half of last season. He scored his five goals in the last 14 games of the season. I expect more from him this season in the offensive side of his game. Michalek has a strong shot that can find its way through traffic. Defensively, he is about as solid as they come. Michalek is a durable player that can consistenly average around 24 minutes a game. He fits well alongside Paul Martin in a shutdown pairing. Like Orpik, he is valuable on the penalty kill, most notably with blocked shots (149 last season). Now that he has a season behind his belt with the Penguins, he fits in well and can be expected to have a lot of success with this team. Paul Martin has always been more of a subtle presence on the ice, but valuable all the same. There has been criticism about his salary, but I think Shero once again got it right picking him up last year. He has a quick, fluid skating style and can keep up an even tempo while racking up the minutes. Martin could have the potential to score more goals, but if the power play continues to only use one defenseman he might not have as many opportunities. He's also not one to take that big shot on net. However, he found chemistry in his pairing with Michalek, and we can expect him to be reliable defenseman in that shutdown pairing. With the final defensive spots on the roster still a bit of a question mark, Ben Lovejoy has been working to prove his case. He had the opportunity to play 47 games last season and show off his skills. Lovejoy has been showing determination in training camp and laying out some heavy hits. He's not afraid to get into a scrap. He skates well and can play a steady defensive game. We also saw an offensive touch from him last year that he can bring to the team this year. His energy is contagious. Depending on what kind of playing time he gets this season, with his developing skills he can fit in well in the 5th or 6th spot. Engelland played in 63 games last season, but it's not certain how much time he will see this season. He won't play big minutes in a game, but he can pack a punch. Last season he had the opportunity to develop and mature his game with increased playing time. Expect to see him out on the ice during matchups that are predicted to be much more physical. Again, Niskanen is another defenseman who we are still not sure what kind of playing time he will get. 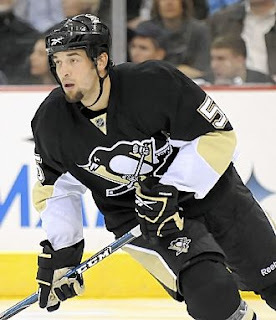 He came to the Pens last season in the trade involving Alex Goligoski. He is another young defenseman trying to better his game. Niskanen did not have a great end to last season, and at times looked lost out on the ice. However, he has performed well in his preseason games to make a case for himself. With tough competition and the depth of defensemen available, if he does not impress he is one to potentially be trade bait. It was thought that Joe Morrow and Brian Strait could have potentially made the NHL roster for a time with their impressive performances in training camp, but were reassigned today to Portand in the WHL and Wilkes-Barre, respectively. Morrow has shown us that he has the talent to become an NHL-caliber defenseman in a few year's time. Strait also had a strong camp and should be successful with the Baby Pens. Hope you enjoyed the read, and I'm looking forward to posting more Blueline Beat recaps very soon!